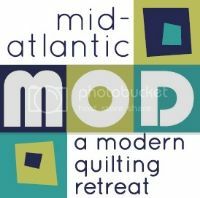 Philadelphia Modern Quilt Guild: Spotlight on... Debbie Hansen and The Little Shop! Spotlight on... Debbie Hansen and The Little Shop! Here's a lovely interview with a fellow guild member who's also a shop owner! Read on to learn more about The Little Shop and Debbie Hansen. My shop, The Little Shop, is located in Haddonfield, NJ . We carry about 3500 bolts of all the major fabric lines, Patterns, Books, batting, notions and threads…All the good stuff! We also develop our own patterns and templates. The Little Shop was featured in Quilt Sampler Magazine, An American Patchwork and Quilting publication, Fall 2007. The shop was a traditional fabric and sewing supply store in the 1960’s and Ann Tomlinson updated it to a quilt shop in the early 80’s. I took a class at the shop to make my first quilt and I never stopped! I began teaching sewing and quilting in the shop in the 90’s and bought the shop in 1997. I have a background in teaching and retail and I love sewing, so, once I started to quilt it seemed like the perfect thing for me! Does your shop offer classes? Yes! We teach a beginners class, then all sorts of techniques… We use our own patterns, templates and then projects from our favorite book s and patterns…… We also offer classes for children, a “Sew What” every Friday evening that is very popular, and quilting retreats twice a year. Our big classes this spring are The Seriously Big Wedding Ring and the new “twister”. And every couple of months we offer a Stash Stew…a great opportunity to use your stash! Do you have sewing machines in the shop? We don’t. We really don’t have room. We have a number of long arm quilters who will meet clients at the shop. They all do our work, so we know how great they are! I just want the shop to be a comfortable place for people to come and relax, be creative, enjoy others and make great quilts! My name is Debbie Hansen. I have twin sons age 31, a daughter- in - law who quilts, and a husband who helps with the shop…Life is good! I come from a sewing family and I love to quilt. I love the old traditional patterns, taken a step up and used with the new fabrics. I love appliqué and am currently working on a project that could be described as sort of contemporary folk art. My grandmother and my mother sewed clothes and home dec things…I have never lived in a house without a sewing room, even if it was only a closet! When I decided I wanted a quilt for my bed, I took a class at The Little Shop, and made one! That’s the hardest question... I love it all... I love the fabrics... I love cutting and sewing … and I love the “Voila!” that happens when you finish a special quilt… and I love sharing it with others. I love star quilts…radiating, sawtooth, feathered…I love them all! I have a hard time sticking with a quilt project that is very repetitive. If I need to make a lot of the same block, I have a hard time finishing. I used to think that basting big quilts on the floor was the hardest thing, but I just don’t do that any more. Thank heaven for long arm quilters! I probably quilt 6 or 8 hours per week. At the shop I reward myself for doing work I don’t care for (bookwork or cleaning) with sewing time. I label quilts if they are going to be in a show, or if they are gifts. Quilts I make for my own family may not get labels, but everyone else…definitely! I like to garden, and every once in a while, I cook! I cooked seriously before I learned to quilt.....now…not so much! Why use 5 fabrics when I could use 50! Thank you so much for taking the time to answer all my questions, Debbie! Hope you all will stop by her shop to say hello! I like your motto -- why use 5 fabrics when you could use 50! Great spotlight!